Yoga is a scientific art of ancient origin that mainly focuses upon body and mind awareness. Literally, Yoga refers to "integration" at all levels of one's existence. The ancient sage Patanjali's yoga sutras written around 400 CE and Swatmarama's Hatha yoga pradipika written in 1400 CE describe the philosophy of yoga, or self-realization that is highly spiritual in nature and offers peace to seekers (Sinha, 1955; Singh, 1979). Nevertheless, it is evident from scientific research studies that regular yoga practice not only showed benefits in treating depression (Babyak et al., 2000; Breslow, Ballard-Barbash, Munoz, & Graubard, 2001) improving mental health (Smith, Greer, Sheets, & Watson, 2011) and flexibility (Howie-Esquivel, Lee, Collier, Mehling, & Fleischmann, 2010; Tran, Holly, Lashbrook, & Amsterdam, 2001), but also demonstrated positive outcomes related to physiological disorders of the cardiovascular region, skeletal muscle functioning (Duren, Cress, & McCully, 2008; Ramos-Jimenez et al., 2009), metabolism (Balaji, Varne, & Ali, 2012; Hegde et al., 2011; Sahay, 2007; Sharma & Knowlden, 2012), and immunity (Field, 2011; Kulkarni & Bera, 2009). Yoga has also shown to have positive influences on inflammation (Kiecolt-Glaser et al., 2010; Sahay, 2007), oxidative stress (Dunn, 2008; Hegde et al., 2011; Innes, Bourguignon, & Taylor, 2005), nerve conduction (Field, 2011) and health outcome analysis through bioelectromagnetism (Kuntsevich, Bushell, & Theise, 2010; Tenforde, 1992). In the present era, yoga has been looked upon as a practically advanced and scientific way to claim health benefits. It has evolved with different modifications by regular experiments, practical analysis, and constant results in order to provide more benefits to mankind. In this process, hot yoga has evolved as a new branch of Hatha yoga with similar poses practiced under elevated room temperature around 41°C (105°F) and at 40% humidity up to 90 min. (Choudhury, 2007). History reveals that the founder of hot yoga is Bikram Choudhury and, therefore, it is also named as Bikram yoga. Apart from this, different modalities of hot yoga with distinct names are in practice, such as Forrest yoga, power yoga, balance yoga, and moksha yoga, which employ the fundamental aspect of heat while practicing yoga postures. The stability of human body's physiological internal system is maintained by homeostasis in varied conditions of body environment such as heat, cold, etc. This is mainly governed by thermoregulatory action by means of negative feedback mechanism. Some reports revealed that hot yoga practice or any other physical activity in ambient temperature could improve flexibility, arterial stiffness, cardiovascular stability, and other regulatory functions of the body (Gonzalez-Alonso et al., 1999; Hunter et al., 2013). However, several researchers explored the adverse effects of hyperthermia-induced activities in body systems based on physical, physiological, neuro-physiological, and biochemical points of view, such as heat-exposed exercise leading to reduction in physical activity (Bruck & Olschewski, 1987; Gonzalez-Alonso et al., 1999; Nielsen et al., 1993; Parkin, Carey, Zhao, & Febbraio, 1999), motivation and voluntary activation (Bruck & Olschewski, 1987; Nybo & Nielsen, 1985), central fatigue (Morrison, Sleivert, & Cheung, 2004; Nielsen, Savard, Richter, Hargreaves, & Saltin 1990; Nybo & Nielsen, 1985; Nybo, Secher, & Nielsen 2002; Racinais Gaoua, & Grantham, 2008; Todd, Butler, Taylor, & Gandevia, 2005), etc. The main influencing factors are impaired body systems, as indicated above, due to muscle fatigue caused by depletion in arterial oxygen (O 2 ) supply (Nybo, 2008), cardiovascular stress (Wilson, Cui, Zhang, & Crandall 2002; 2006), hypoglycaemia (Nybo, 2003), altered neurotransmitter level (Nybo & Secher, 2004), impaired sensory feedback from contracting muscles (Morrison, Sleivert, Cheung, 2004), and inhibited dopaminergic activity (Meeusen & De Meirleir, 1995; Nielsen & Nybo, 2003). In heat stress, there is increased blood flow in the skin as well as increased cardiac output (Gonza΄lez-Alonso, Mora-Rodriguez, & Coyle, 2000; Rowell, Blackmon, Martin, Mazzarella, & Bruce 1965) for thermoregulation. This would provoke high cardiovascular strain leading to high blood pressure (Wyndham et al., 1968) and reduced stroke volume with an upward drift in heart rate to compensate the reduced blood flow to other organs (Radigan & Robinson, 1949; Rowell et al., 1965). This is considered as a dominant factor for reduced performance in hot condition (Fink, Costill, & van handel, 1975; Koslowski et al., 1985). Generally, in heat-induced exercise, more sweat output results in dehydration and hyper tonicity of plasma (Nose, Mack, Shi, & Nadel, 1988a, 1988b) which in turn affects both mental and cognitive performance (Gopinathan, Pichan, & Sharma, 1988; Sawka, 1992). Further, dehydration results in reduction of sweating rate with increased core temperature and heart rate (Gopinathan et al., 1988; Sawka, 1992). With prolonged high core temperature, sweat gland fatigue (hidromeiosis) occurs due to hyper hydration of the surrounding skin (Kerslake, 1972). In fact, there is limitation to combat dehydration caused by sweating process as humans do not have enough capacity for more water intake or store it to replace heat loss (Newman, 1970; Schmidt-Nielsen, 1964). Therefore, it is evident that even a slight elevation of core temperature is also fatal (Burton & Edholm, 1955; Kerslake, 1972). Furthermore, based on morphology, obese have more heat stress and cardiovascular strain due to reduced physical activity (Leithead & Lind, 1964; Minard & Copman, 1963; Ross, 1966; Vaughan & Conahan, 1980). From a metabolic point of view, hyperthermia induces depletion of Adenosine Tri Phosphate (ATP) synthesis, deficiency of O 2 , and elevated muscle lactate (Deborah, Keith, & George, 2004; Ivy et al., 1987). This is a major indication of metabolic stress and low energy intake (Margaria, Edwards, & Dill, 1933; Shorten, Wallman, & Guelfi, 2009) which hampers work rate. In a hot yoga room, due to high humid condition, there would be less O 2 intake that may lead to hypercapnia, hypoventilation, and carbon dioxide (CO 2 )poisoning (Porter, 2011) with elevated respiratory rate. Humidity impairs sweating which acts as an evaporative cooling process (Pandolf, Gonzalez, & Gagge, 1974). Biochemically, it has been found that the rate of production of injury markers, i.e. heat shock proteins (HSP), will be high under heat stress (Horowitz, 1998). 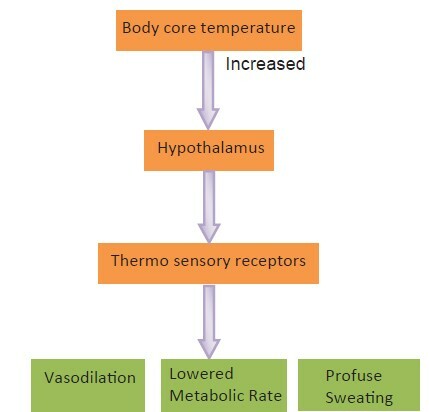 There are many research reports indicating that prolonged exposure to heat-induced physical performance improves the body's homeostasis in terms of acclimation state, aerobic fitness, and hydration level (Wenger, 1988) as well as improves physiological processes like sweating, cardiovascular stability (Hori, 1995; Sawka, Wenger, & Pandolf, 2011), fluid-electrolyte balance (Hori, 1995; Sawka et al., 2011), etc. However, this process depends upon environmental conditions and diet (Armstrong & Maresh, 1991; Brandenberger, Candas, Follenius, & Kahn, 1989), and whether this condition is acquired through continuous or intermittent heat exposure, with or without physical activity is still unclear. The changes that occur with repeated heat exposure and acclimation such as variability in cardiac output (Rowell, Kraning, Kennedy, & Evans, 1967; Wyndham et al., 1968), circulatory changes like blood volume (Senay, Mitchell, & Wyndham, 1976), or venous tone and cardiac filling pressure (Kirsch, Rocker, Ameln, & Hrynyschyn, 1986; Rowell, Kraning, Kennedy, & Evans, 1967) are still under debate. For example, blood volume changes can be caused both by heat exposure and by exercise, training, and posture (Harrison, 1985). Although heat acclimation or adaptation to heat stress enhances physiological processes (Hori, 1995; Sawka, Wenger, & Pandolf, 2011), plasma volume is not maintained in an ideal proportion (Patterson, Stocks, & Taylor, 2004). The acquired physiological benefits through acclimation process are transient and gradually disappear in the absence of continuous heat exposure (Sawka, Castellani, Pandolf, & Young, 2002). Enhanced sweating to acclimation is a matter of controversy, since in hot condition often there is increased sweating rate than can be evaporated (Mitchell et al., 1976). Studies have also shown that heat acclimation does not improve exercise performance of maximal intensity, and endurance of maximally tolerable core temperature (Sawka, Young, Cadarette, Levine, & Pandolf, 1985; Nielsen et al., 1993; Nielsen, Strange, Christensen, Warberg, & Saltin, 1997). The reviews presented above justify that heat-induced exercise or any other physical performance may affect the homeostasis of the body. Hyperthermia and humidity-induced exercise cause increase in peripheral blood circulation (through vasodilation), and body core temperature, which impair visceral organs' functions as well as disturb the sensory feedback mechanism of the central nervous system (Nielsen et al., 1990). This disturbed mechanism further lowers metabolic rate (Ivy et al., 1987), and adversely affects the immune system (Horowitz, 1998) as well as the system of energy intake (Margaria, Edwards, & Dill, 1933). Therefore, the presence of humidity in hot yoga room may impair the respiratory rate, in turn decreasing the lung capacity, leading to oxidative stress as well as lipid peroxidation (Sharma, 2004), though long-term hyperthermia-induced exercise decreases the ill effects of heat stress by means of acclimation. However, the possible mechanisms involved in this process and its period of existence is still under controversy (Mitchell et al., 1976; Nielson et al., 1993, 1997). Meanwhile, it is evident from recent scientific studies that hot yoga does not act as a stimulus to improve the pulmonary functions or maximize the aerobic capacity (Abel, Lloyd, Williams, & Miller, 2012) and is also not fit for practice during pregnancy (Chan, Natekar, & Koren, 2014), whereas traditional yoga practice has been shown to be beneficial (Chuntharapat Petpichetchian, & Hatthakit, 2008; Madanmohan, Jatiya, Udupa, & Bhavanani, 2003). This reveals limitation of hot yoga practice in comparison with proper yogic breathing exercises and asanas. It also implies that hot yoga may actually prevent one from getting the ideal benefits of yoga and spirituality. 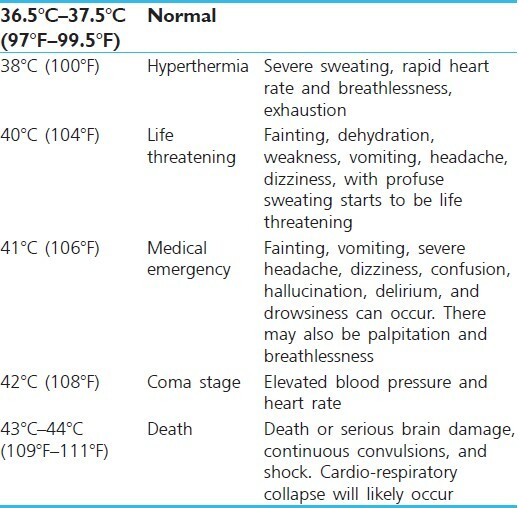 The human temperature variation effects are presented in [Table 1]. Temperature homeostasis of body is maintained through negative feedback mechanism in the form of conduction, convection, and evaporation. Conduction is the exchange of heat between two objects in contact with each other. In convection, exchange of heat between body and air takes place because of increased air flow next to the skin surface, whereas, evaporation is a cooling process in the form of sweat. In heat exhaustion, this thermoregulatory system is impaired leading to profuse sweat and dehydration. Further, it may end up in dizziness, weakness, nausea with elevated heart rate, blood pressure, and respiratory stress. 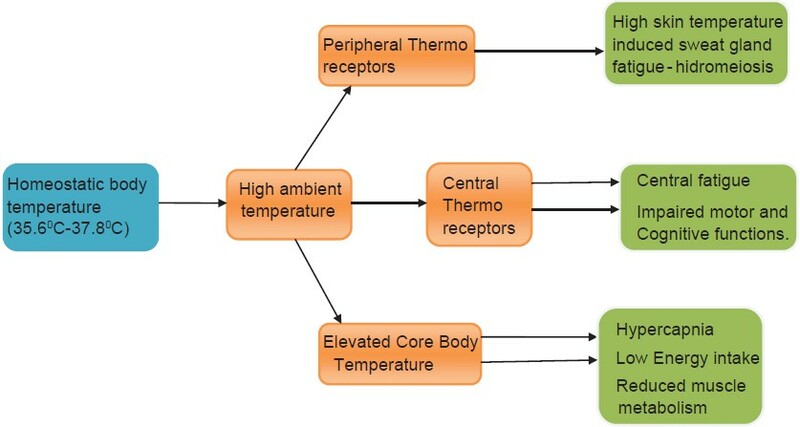 The possible thermoregulatory mechanism in elevated body temperature and the proposed model to explain the effects of heat stress- induced thermoregulation on body homeostasis are illustrated in [Figure 1] and [Figure 2]. It is evident from the available studies that hot yoga may alter the homeostatic regulatory systems of body and mind. There are not many reports on the physical, physiological, biochemical parameters to explore the potential health benefits of hot yoga. In fact, the available scientific research reports in relation to hot yoga and its effect on vital health are not statistically significant. But there are numerous research studies showing a positive influence of traditional Hatha yoga practices on human health. The possible un-conducive heat exposure leading to acquired ill health effects before acclimation process and the mechanisms involved in this process are still unclear. It is quite possible that regained ideal health through acclimation process may suddenly fall without continuous heat exposure. Thus, the influence of alternate training and detraining of hot yoga with reference to age, gender, and aerobic fitness is yet to be studied. Due to these limitations, this study concludes that hot yoga cannot regulate comprehensive health at a cellular level. This also implies that hot yoga may be a deviation from proper application of spiritual and traditional concept of yoga. Abel, A. N., Lloyd, L. K., Williams, J. S., & Miller, B. K. (2012). Physiological characteristics of long-term bikram yoga practitioners. Journal of Exercise Physiology online, 15(5), 32-39. Armstrong, L. E., & Maresh, C. M. (1991). The induction and decay of heat acclimatization in trained athletes. Sports Medicine, 12(5), 302-312. Babyak, M., Blumenthal, J. A., Herman, S., Khatri, P., Doraiswamy, M., Moore, K., … Krishnan, K. R. (2000). Exercise treatment for major depression: Maintenance of therapeutic benefit at 10 months. Psychosomatic Medicine, 62(5), 633-638. Balaji, P.A., Varne, S. R., & Ali, S.S. (2012). Physiological effects of yogic practices and transcendental meditation in health and disease. North American Journal of Medical Sciences, 4(10), 442-448. doi: 10.4103/1947-2714.101980. Brandenberger, G., Candas, V., Follenius, M., & Kahn, J. M. (1989). The influence of initial state of hydration on endocrine responses to exercise in the heat. European Journal of Applied Physiology and Occupational Physiology, 58(6), 674-679. doi: 10.1007/BF00418516. Breslow, R. A., Ballard-Barbash, R., Munoz, K., & Graubard, B. I. (2001). Long-term recreational physical activity and breast cancer in the National Health and Nutrition Examination Survey I epidemiologic follow-up study. Cancer Epidemiology Biomarkers and Prevention, 10(7), 805-808. Bruck, K., & Olschewski, H. (1987). Body temperature related factors diminishing the drive to exercise. Canadian Journal of Physiology and Pharmacology, 65(6), 1274-1280. Burton, A. C., & Edholm, O. G. (1955). Man in a Cold Environment. London: and Education Center's Yoga World newsletter. Chan, J., Natekar, A., & Koren, G. (2014). Hot yoga and pregnancy fitness and hyperthermia. Canadian Family Physician, 60(1), 41-42. Choudhury, B. (2007). Bikram Yoga: The guru behind hot yoga shows the way to radiant health and personal fulfillment. New York: Harper Collins Publishers. Chuntharapat, S., Petpichetchian, W., & Hatthakit, U. (2008). Yoga during pregnancy: effect on maternal comfort, labour pain and birth outcomes. Complimentary Therapies in Clinical Practice, 14(2), 105-115. doi:10.1016/j.ctcp.2007.12.007. Deborah, A. B., Keith, S., & George, M. H. (2004). Physiological effects of exercise. Continuing Education in Anaesthesia, Critical Care and Pain, 4(6), 185-188. doi: 10.1093/bjaceaccp/mkh050. Dunn, K. D. (2008). A review of the literature examining the physiological processes underlying the therapeutic benefits of hatha yoga. Advances in Mind Body Medicine, 23(3), 10-18. Duren, C. M., Cress, M. E., & McCully, K. K. (2008). The influence of physical activity and yoga on central arterial stiffness. Dynamic Medicine, 7, 2. doi: 10.1186/1476-5918-7-2. Field, T. (2011). Yoga clinical research review. Complementary Therapies in Clinical Practice, 17(1), 1-8. doi:10.1016/j.ctcp.2010.09.007. Fink, A. J., Costill, D. L., & Van Handel, P. J. (1975). Leg muscle metabolism during exercise in the heat and cold. European Journal of Applied Physiology, 34(3), 183-190. Gonzalez-Alonso, J., Mora-Rodriguez, J. R., & Coyle, E. F. (2000). Stroke volume during exercise: interaction of environment and hydration. American Journal of Physiology Heart and Circulatory Physiology, 278(2), 321-330. Gonzalez-Alonso, J., Teller, C., Andersen, S. L., Jensen, F. B., Hyldig, T., & Nielsen, B. (1999). Influence of body temperature on the development of fatigue during prolonged exercise in the heat. Journal of Applied Physiology, 86(3), 1032-1039. Gopinathan, P. M., Pichan, G., & Sharma, V. M. (1988). Role of dehydration in heat stress induced variations in mental performance. Archives of Environmental Health, 43(1), 15-17. Hunter, S. D., Dhindsa, M. S., Cunningham, E., Tarumi, T., Alkatan, M., Naulnim, N., ... Tanaka, H. (2013). The effect of bikram yoga on arterial stiffness in young and older adults. Journal of Alternative and Complimentary Medicine, 19(12), 930-934. Harrison, M. H. (1985). Effects of thermal stress and exercise on blood volume in humans. Physiological Reviews, 65(1), 149-209. Hegde, S. V., Adhikari, P., Kotian, S., Pinto, V. J., D'Souza, S., & D'Souza, V. (2011). Effect of 3-month yoga on oxidative stress in type 2 diabetes with or without complications: A controlled clinical trial. Diabetes Care, 34(10), 2208-2210. doi: 10.2337/dc10-2430. Hori, S. (1995). Adaptation to heat. Japanese Journal of Physiology, 45, 921-946. Horowitz, M. (1998). Do cellular heat acclimation responses modulate central thermoregulatory activity? Physiology, 13(5), 218-225. Howie-Esquivel, J., Lee, J., Collier, G., Mehling, W., & Fleischmann, K. (2010). Yoga in heart failure patients: a pilot study. Journal of Cardiac Failure, 16(1), 742-749. Innes, K. E., Bourguignon, C., & Taylor A. G. (2005). Risk indices associated with the insulin resistance syndrome, cardiovascular disease, and possible protection with yoga: A systematic review. Journal of the American Board of Family Practice, 18(6), 491-519. Ivy, J. L., Chi, M. M., Hintz, C. S., Sherman, W. M., Hellendall, R. P., & Lowry, O. H. (1987). Progressive metabolite changes in individual human muscle fibres with increasing work rates. American Journal of Physiology, 252(6 Pt 1), C630-C639. Kerslake, D. M. (1972). The stress of hot environments. Cambridge: Cambridge University Press. Kiecolt-Glaser, J. K., Christian, L., Preston, H., Houts, C. R., Malarkey, W. B., Emery, C. F., ... Glaser, R. (2010). Stress, inflammation, and yoga practice. Psychosomatic Medicine, 72(2), 113-21. Kirsch, K. A., Rocker, L., Ameln, H., & Hrynyschyn, K. (1986). The cardiac filling pressure following exercise and thermal stress. The Yale Journal of Biology and Medicine, 59(3), 257-265. Kozlowski, S., Brzezinska Z., Kruk, B., Kaciuba-uscilko, H., Greenleaf, J. E., & Nazar, K. (1985). Exercise hyperthermia as a factor limiting physical performance: Temperature effect on muscle metabolism. Journal of Applied Physiology, 59(3), 766-773. Kulkarni, D. D., & Bera, T. K. (2009). Yogic exercises and health - A psycho-neuro immunological approach. Indian Journal of Physiology and Pharmacology, 53(1), 3-15. Kuntsevich, V., Bushell, W. C., & Theise, N. D. (2010). Mechanisms of yogic practices in health, aging, and disease. Mount Sinai Journal of Medicine: A Journal of Translational and Personalized Medicine 77(5), 559-569. Leithead, C. S., & Lind, A. R. (1964). Heat stress and heat disorders. Heat Stress and Heat Disorders. Phildelphia: Davis. Record No. 19642702448. Mandanmohan., Jatiya, L., Udupa, K., & Bhavanani, A. B. (2003). Effect of yoga training on handgrip, respiratory pressures and pulmonary function. Indian Journal of Physiology and Pharmacology, 47(4), 387-392. Margaria, R., Edwards, H. T., & Dill, D. B. (1933). The possible mechanisms of contracting and paying the oxygen debt and the role of lactic acid in muscle contraction. American Journal of Physiology, 106(3), 689-715. Meeusen, R., & De Meirleir, K. (1995). Exercise and brain neurotransmission. Sports Medicine, 20(3), 160-188. Minard, D., & Copman, L. (1963). Elevation in body temperature. In Health in Temperature: Its Measurement and Control in Science and Industry, (Hardy, J. D. ed. pp. 527-43.) New York: Reinhold. Mitchell, D., Senay, L. C., Wyndham, C. H., van Rensburg, A. J., Rogers, G. G., & Strydom, N. B. (1976). Acclimatization in a hot, humid environment: energy exchange, body temperature, and sweating. Journal of Applied Physiology, 40(5), 768-778. Morrison, S., Sleivert, G. G., & Cheung, S. S. (2004). Passive hyperthermia reduces voluntary activation and isometric force production. European Journal of Applied Physiology, 91(5-6), 729-736. Newman, R. W. (1970). Why is man such a sweaty, thirsty, naked animal: A speculative review. Human Biology, 42(1), 12-27. Nielsen, B., & Nybo, L. (2003). Cerebral changes during exercise in the heat. Sports Medicine, 33(1), 1-11. Nielsen, B., Hales, J. R., Strange, S., Christensen, N. J., Warberg, J., & Saltin, B. (1993). Human circulatory and thermoregulatory adaptation with heat acclimation and exercise in a hot, dry environment. The Journal of Physiology, 460 (1), 467-485. Nielsen, B., Savard, G., Richter, E. A., Hargreaves, M., & Saltin, B. (1990). Muscle blood flow and metabolism during exercise and heat stress. Journal of Applied Physiology, 69(3), 1040-1046. Nielsen, B., Strange, S., Christensen, N.J., Warberg, J., & Saltin, B. (1997). Acute and adaptive responses in humans to exercise in a warm, humid environment. Pflügers Archiv, 434(1), 49-56. Nose, H., Mack, G. W., Shi, X., & Nadel, E. R. (1988a). Involvement of sodium retention hormones during rehydration in humans. Journal of Applied Physiology, 65(1), 332-336. Nose, H., Mack, G. W., Shi, X., & Nadel, E. R. (1988b). Role of osmolality and plasma volume during rehydration in humans. Journal of Applied Physiology, 65(1), 325-331. Nybo, L. (2003). CNS fatigue and prolonged exercise- effect of glucose supplementation. Medicine and Science in Sports and Exercise, 35(4), 589-584. Nybo, L. (2008). Hyperthermia and fatigue. Journal of Applied Physiology, 104(3), 871-878. Nybo, L., & Nielsen, B. (1985). Hyperthermia and central fatigue during prolonged exercise in humans. Journal of Applied Physiology, 91(3), 1055-1060. Nybo, L., & Secher, N. H. (2004). Cerebral perturbations provoked by prolonged exercise. Progress in Neurobiology, 72(4), 223-261. Nybo, L., Secher, N. H., & Nielsen, B. (2002). Inadequate heat release from the human brain during prolonged exercise with hyperthermia. Journal of Physiology, 545(Pt 2), 697-704. Pandolf, K. B., Gonzalez, R. R., & Gagge, A. P. (1974). Physiological strain during light exercise in hot-humid environments. Aerospace Medicine, 45(4), 359-365. Parkin, J. M., Carey, M. F., Zhao, S., & Febbraio, M. A. (1999). Effect of ambient temperature on human skeletal muscle metabolism during fatiguing submaximal exercise. Journal of Applied Physiology, 86(3), 902-908. Patterson, M. J., Stocks, J. M., & Taylor, N. A. (2004). Sustained and generalized extracellular fluid expansion following heat acclimation. Journal of Physiology, 559(Pt 1), 327-334. Porter, S. (2011). The cardiovascular effects of "hot" yoga. Retrieved February 15, 2014, from http://www.docstoc.com/docs/134947751/The-cardiovascular-effects-of-%E2%80%9Chot%E2%80%9D-yoga. Racinais, S., Gaoua, N., & Grantham, J. (2008). Hyperthermia impairs short-term memory and peripheral motor drive transmission. Journal of Physiology, 586(Pt 19), 4751-4762. Radigan, L. R., & Robinson, S. (1949). Effects of environmental heat stress and exercise on renal blood flow and filtration rate. Journal of Applied Physiology 2(4), 185-191. Ramos-Jimenez, A., Hernandez-Torres, R. P., Wall-Medrano, A., Munoz-Daw, M. D., Torres-Duran, P. V., & Juarez-Oropeza, M. A. (2009). Cardiovascular and metabolic effects of intensive Hatha Yoga training in middle-aged and older women from northern Mexico. International Journal of Yoga, 2(2), 49-54. doi: 10.4103/0973-6131.60044. Ross, F. (1966). Medical problems related to the hostile environment, III: Problems related to heat. Southwest Medicine, 47(5), 137-148. Rowell, L. B., Blackmon, J. R., Martin, R. H., Mazzarella, J. A. & Bruce, R. A. (1965). Hepatic clearance of indocyanine green in man under thermal and exercise stresses. Journal of Applied Physiology 20(3), 384-394. Rowell, L. B., Kraning, K. K., Kennedy, J. W. & Evans, T. O. (1967). Central circulatory responses to work in dry heat before and after acclimatization. Journal of Applied Physiology 22(3), 509-518. Sahay, B. K. (2007). Role of yoga in diabetes. Journal of the Association of Physicians of India, 55, 121-126. Sawka, M. N. (1992). Physiological consequences of hypohydration: Exercise performance and thermoregulation. Medicine and Science in Sports and Exercise 24(6), 657-670. Sawka, M. N., Castellani, J. W., Pandolf, K. B., & Young, A. J. (2002). Human adaptations to heat and cold stress. Retrieved January 20, 2014, from http://www.dtic.mil/cgi-bin/GetTRDoc?AD=ADP012427. Sawka, M. N., Wenger, C. B., & Pandolf ,K. B. (2011). Thermoregulatory responses to acute exercise-heatstress sand heat acclimation. Comprehensive Physiology. doi:10.1002/cphy.cpo40109. Sawka, M. N., Young, A. J., Cadarette, B. S., Levine, L., & Pandolf, K. B. (1985). Influence of heat stress and acclimation on maximal aerobic power. European Journal of Applied Physiology, 53(4), 294-298. Schmidt-Nielsen, K. (1964). Desert Animals. Oxford: Oxford University Press. Senay, L. C., Mitchell, D., & Wyndham, C. H. (1976). Acclimatization in a hot, humid environment: Body fluid adjustments. Journal of Applied Physiology 40(5), 786-796. Sharma, M., & Knowlden, A. P. (2012). Role of yoga in preventing and controlling type 2 diabetes mellitus. Journal of Evidence-Based Complementary and Alternative Medicine 17, 88-95. Shorten, A. L., Wallman, K. E., & Guelfi, K. J. (2009). Acute effect of environmental temperature during exercise on subsequent energy intake in active men. American Journal of Clinical Nutrition, 90(5), 1215-1221. Sing, P. (1979). Hatha yoga pradipika. New Delhi, India: Sri Satguru Publications. Sinha, J. (1955). The Foundation of Hinduism. Calcutta, India: Sinha Publishing House. Smith, J. A., Greer, T., Sheets, T., & Watson, S. (2011). Is there more to yoga than exercise? American Family Physician, 17(3), 22-29. Tenforde, T. S. (1992). Biological interactions and potential health effects of extremely-low-frequency magnetic fields from power lines and other common sources. Annual Review of Public Health, 13, 173-196. Todd, G., Butler, J. E., Taylor, J. L., & Gandevia, S. C. (2005). Hyperthermia: A failure of the motor cortex and the muscle. Journal of Physiology, 563(Pt 2), 621-631. Tran, M. D., Holly, R. G., Lashbrook, J., & Amsterdam, E. A. (2001). Effects of hatha yoga practice on the health-related aspects of physical fitness. Preventive Cardiology, 4(4), 165-170. Vaughan, R. W., & Conahan, T. J. (1980). Cardiopulmonary consequences of morbid obesity. Life Science, 26(25), 2119-2127. Wenger, C. B. (1988). Human heat acclimatization. In K. B. Pandolf, M. N. Sawka, & R. R. Gonzalez (Eds. ), Human performance physiology and environmental medicine at terrestrial extremes (pp.153-197). Indianapolis, IN: Benchmark Press. Wilson, T. E., Cui, J., Zhang, R., & Crandall, C. G. (2006). Heat stress reduces cerebral blood velocity and markedly impairs orthostatic tolerance in humans. American Journal of Physiology Regularatory Integrative and Complimentary Physiology, 291(5), R1443-R1448. Wilson, T. E., Cui, J., Zhang, R., Witkowski, S., & Crandall, C. G. (2002). Skin cooling maintains cerebral blood flow velocity and orthostatic tolerance during tilting in heated humans. Journal of Applied Physiology, 93(1), 85-91. Wyndham, C. H., Benade, A. J., Williams, C. G., Strydom, N. B., Goldin, A., & Heyns, A. J. (1968). Changes in central circulation and body fluid spaces during acclimatization to heat. Journal of Applied Physiology, 25(5), 586-593. Winslow, E.A., Herrington, L.P., & Gagge, A.P. (1937). Physiological reactions of the human body to varying environmental temperatures. American Journal of Physiology, 120(1), 1-22.